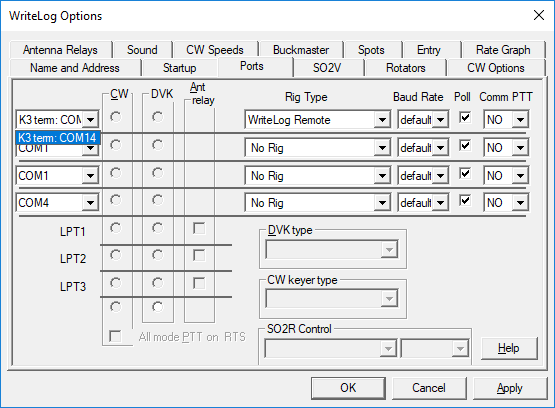 WriteLog Remote Control includes the ability to connect an Elecraft K3 in terminal mode from WriteLog’s control site to its remote site. 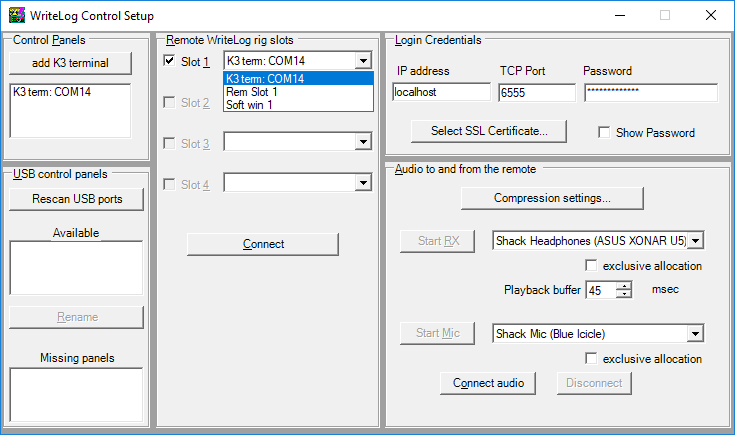 Here is an exercise you can do on your shack computer to exercise WriteLog Remote Control and see how it works but without needing a second PC to do the control. 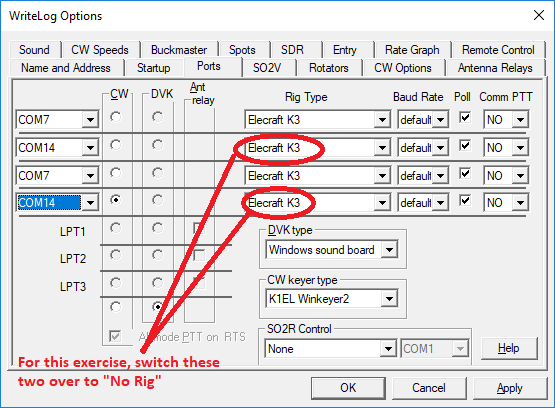 If you have two K3’s available, you already have everything you need to exercise WriteLog remote controling the K3. Start by working through the exercise in the previous post: https://writelog.com/remote-control-exercise. The Soft Win setting specified in that earlier test needs no addtional hardware. We’ll use a different setup below to configure the K3. Close down the WriteLog Control Site from that exercise. Your remote site WriteLog window remains on the screen and goes back to its normal display arrangement. On th3 WriteLog main window (which will become the remote site under control) lets get your INI file saved so you can restore the K3 setup we’re about to change. Exit WriteLog. Start WriteLog normally, but use the startup screen, Export to save your INI settings to go back easily when this exercise is done. Now Setup/WriteLog-Options/Ports to bring up this screen. OK the setup ports dialog. Here is the new stuff! Use WriteLog’s violet lightning bolt control site desktop icon to start the control site. For this exercise, use “New Log” on WriteLog Control Site’s startup screen, and that takes you to this screen. 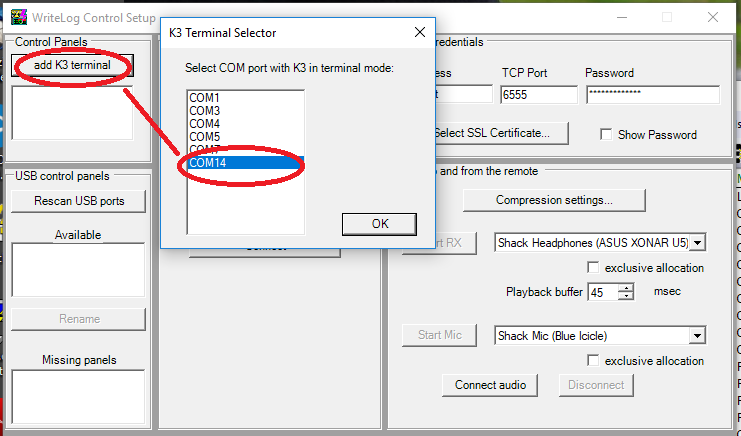 Use the add K3 terminal to add the COM port you removed from the remote site above. 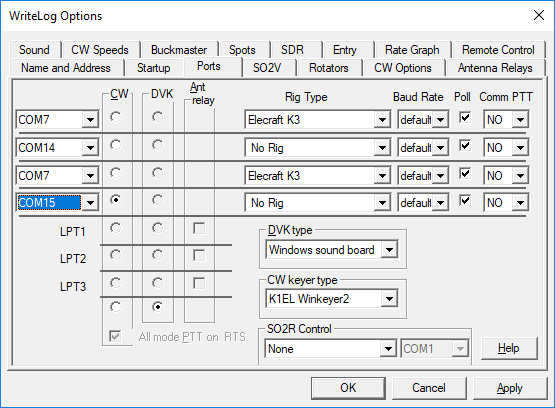 Set slot 1 of the control site to use the K3 on COM14. Now is a good time to ensure the K3 at the control site is in its terminal mode. Hold down its MENU button until you see the word “TERM” where the VFOB frequency is usually displayed. Don’t forget how to undo this! When you’re finished with this experiment, hold down MENU again until it goes back to NORM. Use the Connect button in the middle and WriteLog control site asks you to select a contest. Select your favorite as the result doesn’t matter for this exercise. At this point you have two WriteLog screens on your PC, but the control site probably exactly covers up the remote one. Move the control site WriteLog main window to reveal two WriteLog’s running. On the WriteLog Control Site, use Setup/WriteLog-Options/Ports in order to connect a WriteLog Control Site Entry Window to the now remoted K3. Click OK to see how things work.